MLB coaches impart the knowledge and skills for Asian Coaches. 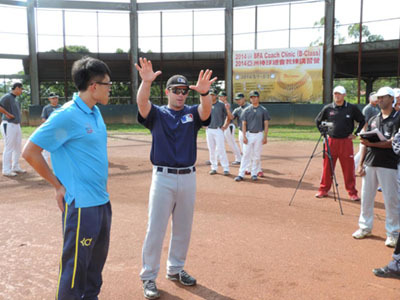 The BFA recently concluded successful Coach Clinic, which hosted by Chinese Taipei Baseball Association (CTBA). More than 33 coaches from Chinese Taipei, Hong Kong, Indonesia, Pakistan, Philippines, Singapore, Sri Lanka and Thailand to participated the coach clinic in Taiwan. Led by MLB coaches, the coach clinic comprised three days of warm up, throwing drills, outfield play, dry swing drills, hitting drills, pitching mechanic drills and care and prevention in Taoyuan, Taiwan. “The reason for organizing this coach clinic is to provide Asian coaches an opportunity to improve the coach skill and knowledge, learn more different way to find out the best way for player,” said Charles Yang, BFA Chairman of Technical Committee. As BFA U12 championship will held on Philippine on 27-31 August, 2014. BFA deeply hope this coach clinic can bring more impact for Asian coaches. Download Teaching material, as below.